Yesterday, when I got the first news of earthquake in Sikkim, I reacted like how everyone else would: think of the friends I had there. At least one of my friends – a photographer with the state forest department -lived close to Namche Bazar - the epicenter of the earthquake. Another close friend – Ankit Sood- had been a roaming nomad, travelling around the state as an advisor on eco-tourism. It took my entire day to reach them. Finally, by this evening, I managed to hear from both, and a few others; everyone had got a few bruises here and there, but were generally fine. Now, with the worries over my near ones’ safety behind me, I am full of memories of the state and its abundant beauty as I experienced during my three trips. story on how mountain states are using eco tourism a means to provide livelihood to local communities and stop organized crime such as poaching. The story, published in Planet Earth magazine, took me to Khangchendzonga National Park. Home to endless number of orchids and birds and butterflies the park is breathtaking and houses the Dubdi, Sikkim’s oldest monastery. The eco-tourism project – started in 1996 - there has been a big success. The same year - October to be exact - I was in Sikkim again, this time in Namchi – the epicenter of the earthquake. The picturesque town was organizing another picturesque event: Namchi Mahotsav. It was a week-long cultural program and I had the opportunity to eat a lot of local food, watch cultural performances by different ethnic groups like Bhutia, Lecpha , Rai, and Newar. 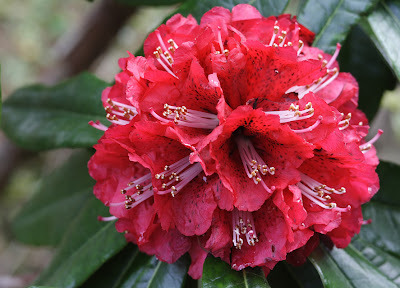 But the most memorable visit to Sikkim for me was last year when the state was celebrating one of the most colorful event I have ever seen: The International Rhododendron Festival 2010. The first of its kind in the entire Himalayas, the festival was literally a riot of colors and a great show of nature’s grandeur. When I reached Singba Rhododendron Sanctuary, the venue of the festival and home to - hold your breath - 36 species of the flower, I knew why Sikkim was such a big hit with eco tourists: Mother nature, as though compensating the state for being mountainous and therefore unfit for big industries, has showered all her kindness upon Sikkim. The crisp fresh mountain air, the orchids, the rhododendrons, the birds and the bees, the Buddhist prayer flags, the music and the wide smiles of the people – everything just fitted into this simple and naturally beautiful picture called Sikkim. And now the same nature has turned turbulent, killing, destroying lives. Will it be long before this painful rage is gone? That's one prayer I can always say, can't I?